Steam butternut squash to package instructions, then place into bowl of a food processor with ricotta, salt, pepper, red pepper and sage. Pulse until smooth. Pour water into a small bowl and lay out wonton wrappers. Place 1 teaspoon filling in the center of a wonton wrapper. Dip your finger in water to wet all four edges of the wrapper. Place another wrapper on top and press to seal. Repeat until all filling and wrappers are used. Heat a pan over medium heat. Add in half of butter and melt until it begins to brown. 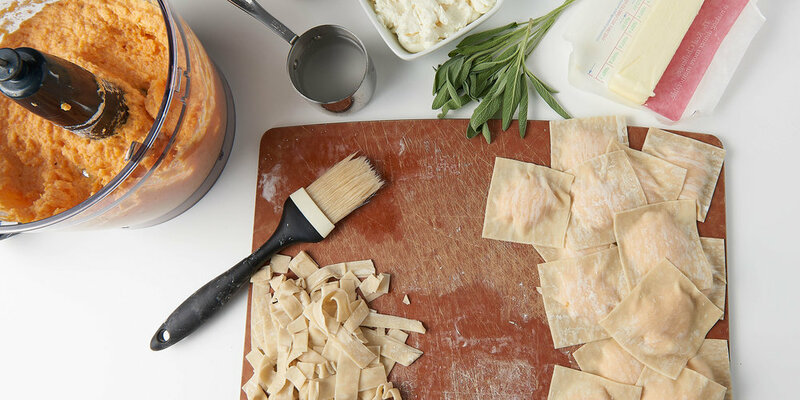 Add in half of prepared ravioli and sage and sauté 2–3 minutes until translucent and edges have crisped. Place in a serving bowl, then repeat with other half. Serve immediately.